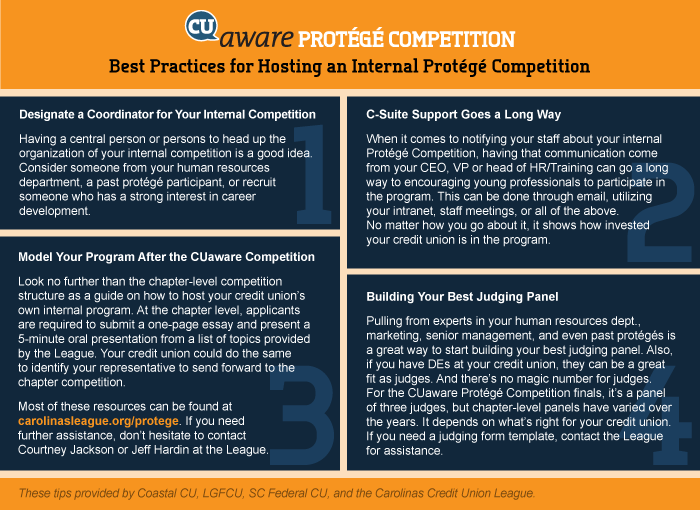 On October 2, 2018 at 6:00 pm the Upstate Chapter will host the chapter-level CUaware Protégé Competition for eligible credit union professionals, ages 18-35 at the Commerce Club, 55 Beattie Place, 17th Floor, One Liberty Square Building, Greenville SC 29601. Each credit union is encouraged to select one candidate to represent them in the chapter-level competition. Judging will be based on a standard application essay and a five-minute oral presentation. Candidates will have a wide range of speech topic choices available. The deadline to submit your application and essay to the chapter is Friday, September 21, 2018. Once a chapter winner is determined, he or she will move on to the finals at the Carolinas Credit Union League’s conference in Charlotte, NC (Jan. 31 - Feb 1, 2019), where all finalists will make their presentations and complete a brief exam testing their credit union knowledge. Go to carolinasleague.org/protege to download the application and other necessary forms in order to compete. The winner and two runners-up at the finals in January 2019 will receive special benefits including scholarship opportunities at regionally recognized conferences and places on the CUaware Council. Need tips on how to host an internal competition at your credit union? See this guide on best practices.